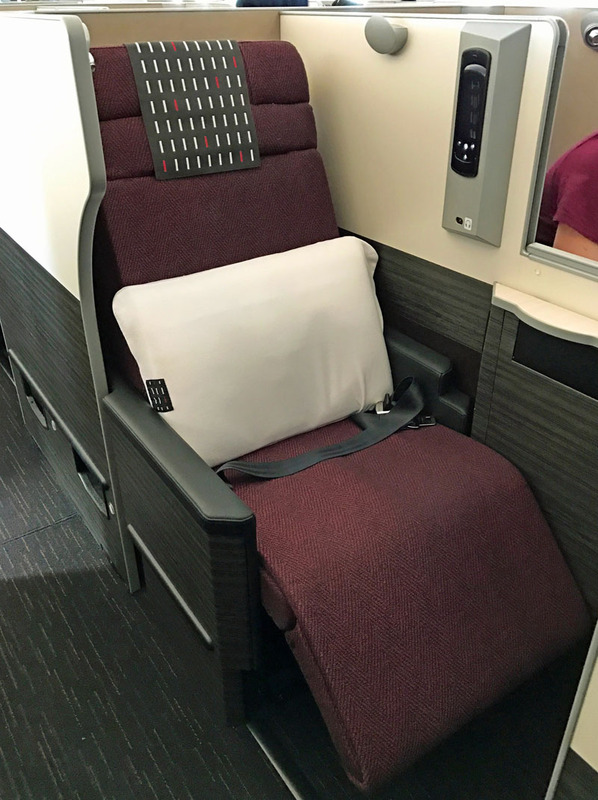 Japan Airlines (JAL) is a highly regarded airline and expectations were high before my first ever business class flight with JAL, from Sydney to Tokyo. The airline didn’t disappoint. 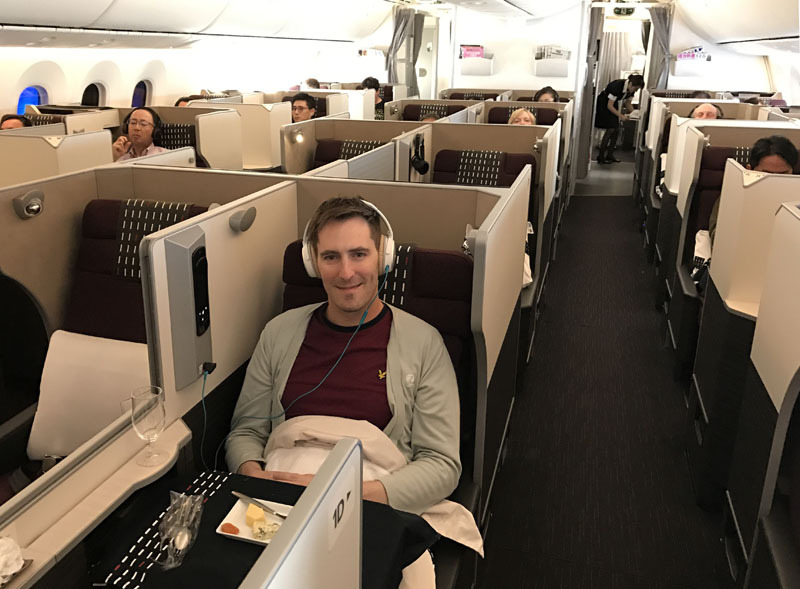 The advanced Boeing 787 Dreamliner that JAL operates on this route, together with the airline’s excellent customer service, dining and seats, made for a stylish, comfortable and memorable flight – one of the best I’ve ever had in business class. 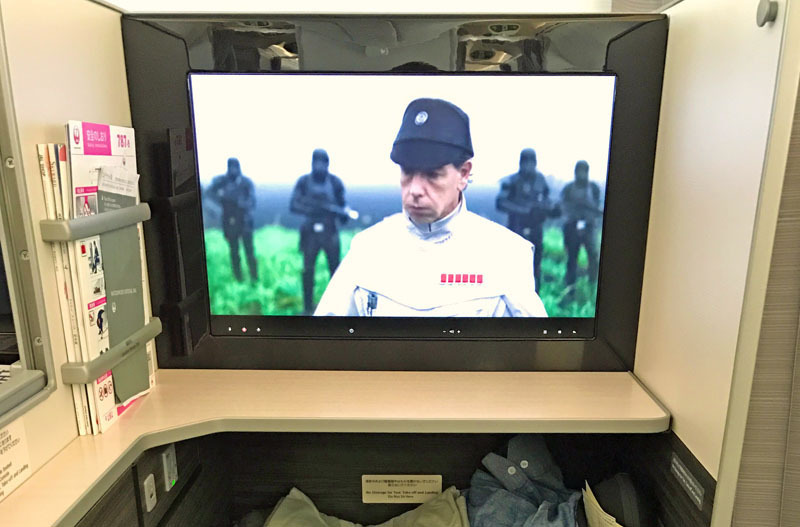 I would definitely recommend flying with JAL, which operates from both Sydney and Melbourne to Tokyo and onwards to Europe, Asia, and North America. 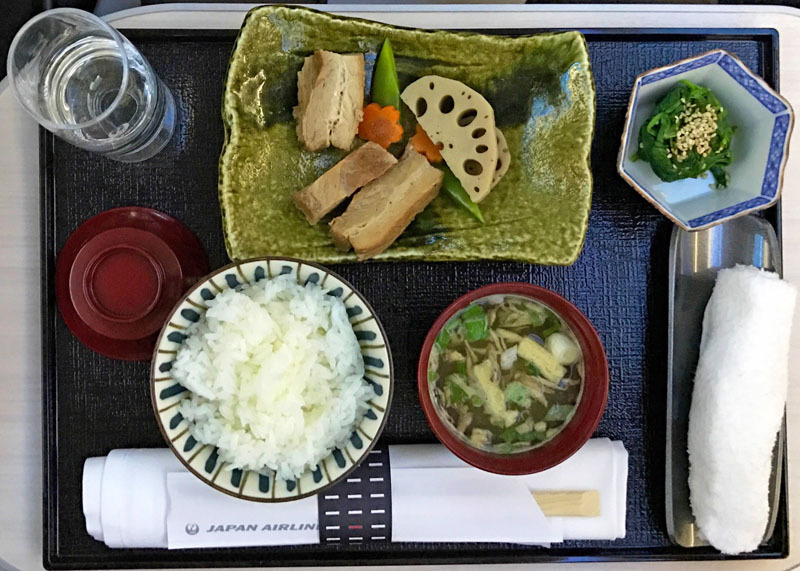 Flying with JAL is a great way to start a trip – you’ll feel like you’re experiencing Japan from the moment you set foot on board. As JAL is a member of oneworld, you can use Qantas Points to book, or earn Qantas Points and status credits on a paid ticket: a welcome feature for Qantas Frequent Flyer members. Here’s an overview of what you can expect flying with JAL. JAL doesn’t operate a lounge at Sydney Airport, instead directing customers to the Qantas business lounge. Nearby, there’s also an Amex lounge that some Amex cardholders can access, which I briefly checked out, but the Qantas lounge offered more space and better dining. Since there’s no JAL lounge to review, I’ll keep my comments on the Qantas lounge brief. It’s fairly comfortable, though not particularly lux, with good food and beverages on offer, including several hot and cold breakfast options when I was there, barista-made coffee, fresh fruit and vegetable juice made to order, and a full bar. When I arrived around 7 am the lounge was almost empty, but it started to fill up quickly a bit later. Multiple oneworld airlines use this lounge, so it gets quite busy during peak periods. If you’re a Qantas Platinum or oneworld emerald status holder, the luxurious Qantas First lounge will be your best bet. I was very pleased that JAL started operating a Dreamliner on the Sydney – Tokyo route just days before my flight. The advanced aircraft is quite comfortable for flying thanks to the quieter cabin and higher air pressure and humidity. The cabin was tastefully decorated in dark, warm tones, and together with LED mood lighting and dimmable windows, felt quite elegant and soothing. There were 42 business class seats in a 2-2-2 layout across 7 rows – four rows up front, followed by toilets and a galley, and then three further rows in a separate ‘mini cabin’. Normally, I’d say a 2-2-2 layout is a bit ordinary because window seat passengers don’t have direct aisle access, but that’s not an issue with JAL, thanks to its unique seat design. A slightly staggered layout gives all window seat passengers a walkway into the aisle, which actually makes the window seats, with their extra privacy, the best seats for solo travellers, in my opinion. The middle two seats are not staggered, offering a good option for couples, and this is what my partner and I chose. There’s a privacy screen between all adjoining seats that can be raised or lowered as you wish. 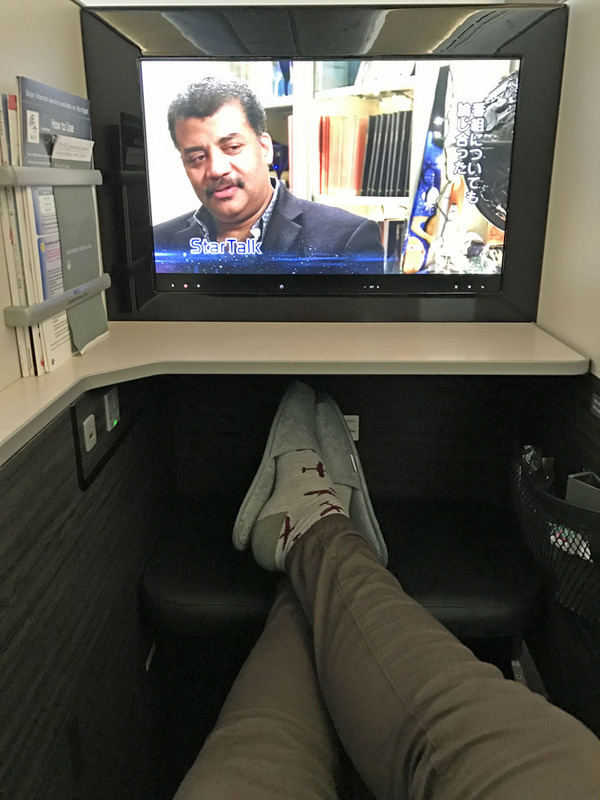 The business class “Sky Suite” seat was very comfortable, with good padding and multiple recline options, including fully flat. The crew attach a mattress for sleeping. At 25.5 inches wide, the seat is more spacious than you might expect given the layout. However, I did notice that, when fully flat, I could only barely stretch out fully, and I’m only 176 cm tall. This could be an issue for taller people when trying to sleep. An ottoman under the entertainment screen provided a foot rest and leg room for sleeping. The seat included various mod-cons such as a massage function, reading light, USB port and AC power with a universal plug-in. The storage space was quite limited – just a side pocket, the ottoman and floor below it, and the space under the entertainment screen. It was a bit tricky storing small personal items within reach, but I managed. I noticed that the side seats had a bit more storage due to the staggered layout. As I boarded the plane, arranged on my seat were a good quality pillow, blanket, amenity kit, noise-cancelling headphones, and slightly-too-small slippers and a cardigan. 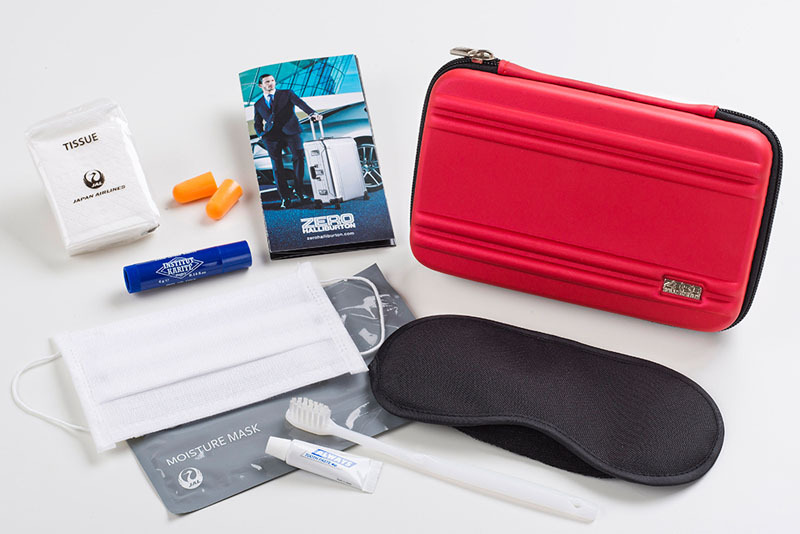 The amenity kit made by Zero Halliburton included all the usual elements, plus a refreshing facial moisture mask, which is a great idea in the air. The crew provided excellent customer service – as you would expect from a Japanese airline. The crew were attentive and quick to respond to requests throughout the flight, as well as very polite and observant of Japanese customs (which included a lot of bowing) – an experience that made me feel like I was already in Japan. Upon boarding, we were greeted warmly and offered a drink of orange juice or champagne, which was Charles Heidsieck Brut Reserve – a pretty good drop (though, oddly, served in a plastic glass). Shortly after takeoff, the crew came around to take food and drink orders, and then the dining service began. There’s not much more I can say about the service except that it was at a high standard throughout the flight. The only minor criticism I have is that the crew didn’t come around to collect rubbish very frequently – such as empty water bottles and plastic wrapping – but this wasn’t a big inconvenience. The dining was a highlight on this flight. 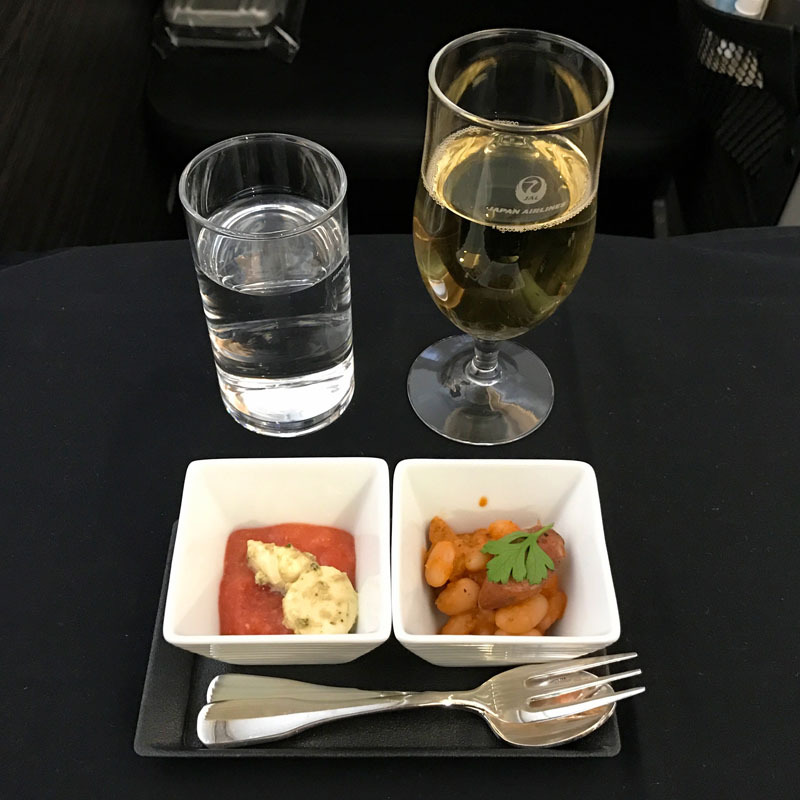 The menu was varied and interesting, and the quality of the food and drinks was among the best I’ve experienced in business class. 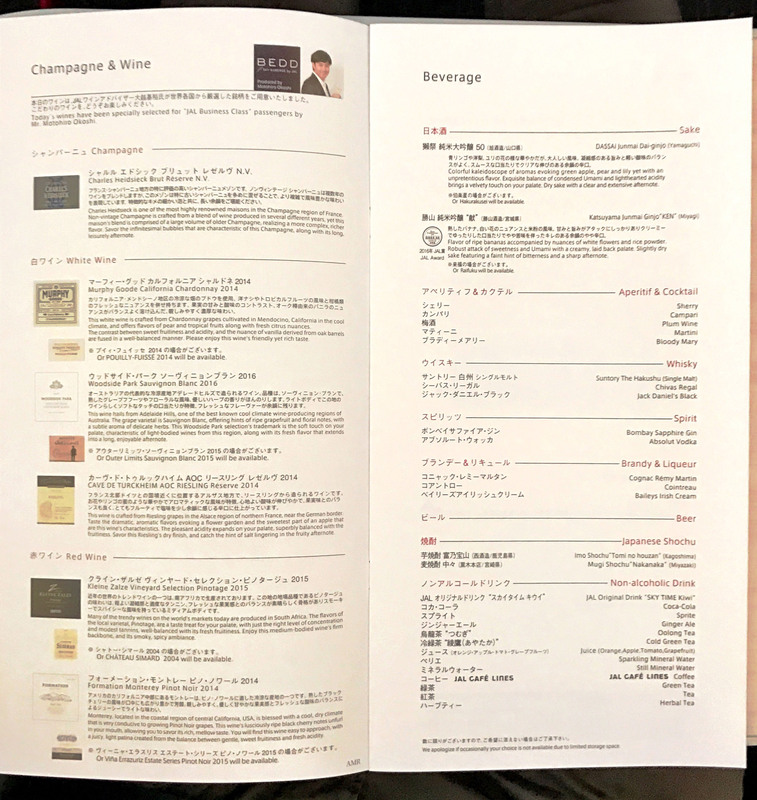 There was a large selection of drinks on offer – all the usual suspects, including wine from Australia, California, France and South Africa, and four types of sake (only two of which were on the menu – the others the crew offered when I asked for a recommendation). You can view the full drinks menu here if you’re interested. 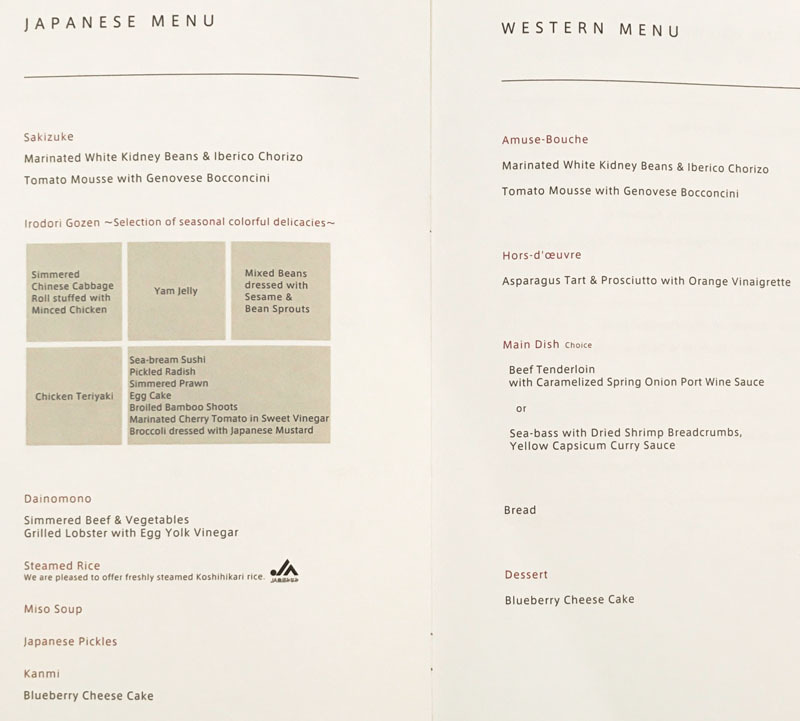 The dining menu was structured so that a lunch meal was served shortly after take-off, after which time we could order anything from the dine-on-demand menu until 90 minutes before landing in Tokyo. I thought this was a great approach – get everyone fed quickly, and then people could choose when and what to eat (the dine-on-demand concept is becoming increasingly popular with airlines). 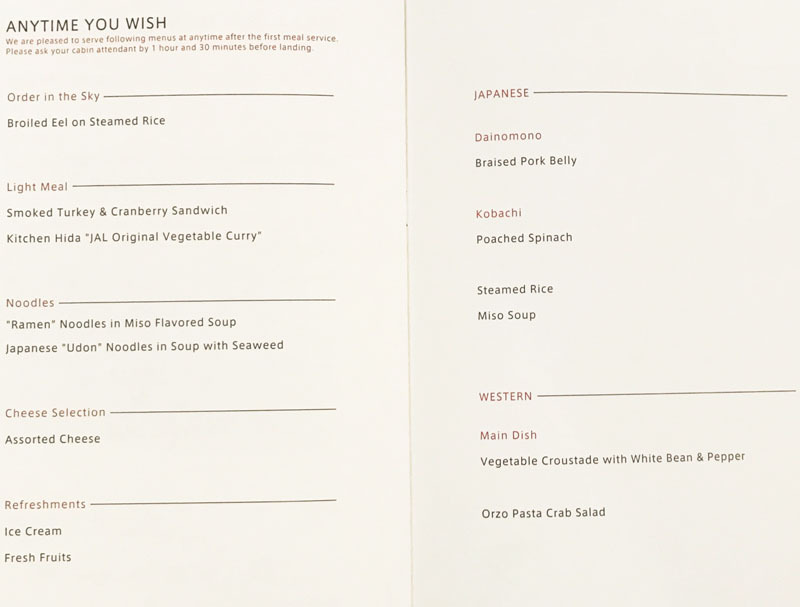 For lunch, we had a choice of a Japanese or Western menu, both consisting of a generous four courses. I chose the Japanese menu, which began with a not-very-Japanese amuse bouche of tomato mousse and bocconcini (which was refreshing and flavourful) and chorizo with beans (which added some nice textures). I paired this with the Murphy Goode California Chardonnay 2014, which was the only wine I tried on this flight (focusing instead on the sake!). The second course was a sampling menu of various Japanese delicacies, including meats, vegetables and pickles. This is a common way to dine in Japan and the quality of the food was great. I really enjoyed all the flavours on offer. Next came simmered beef and vegetables, grilled lobster and accompaniments. 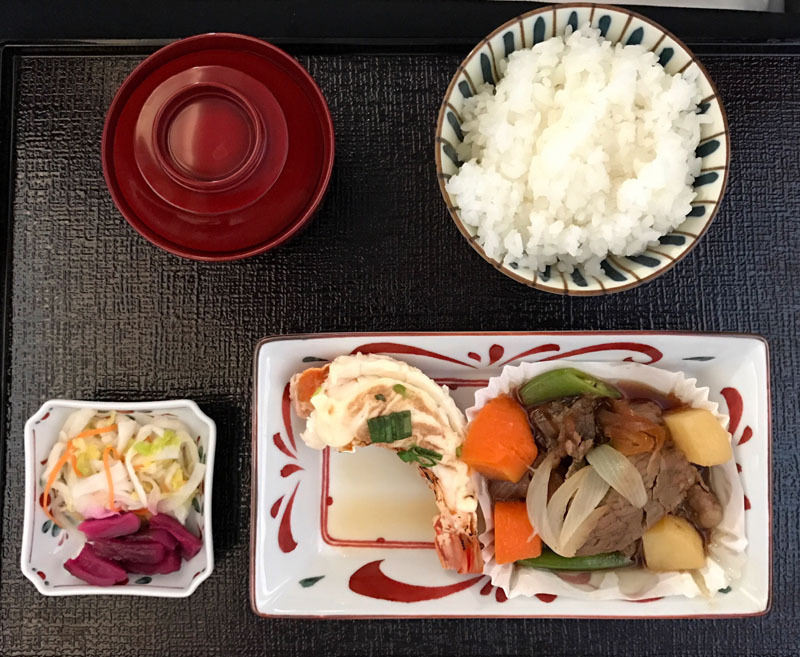 My first reaction was that it’s very brave to serve lobster on a plane, and perhaps ambition got the better of JAL because the meat was a bit dry (or maybe that’s just how lobster usually tastes – I rarely have it). However, the beef and veggies were very nicely cooked and flavourful. 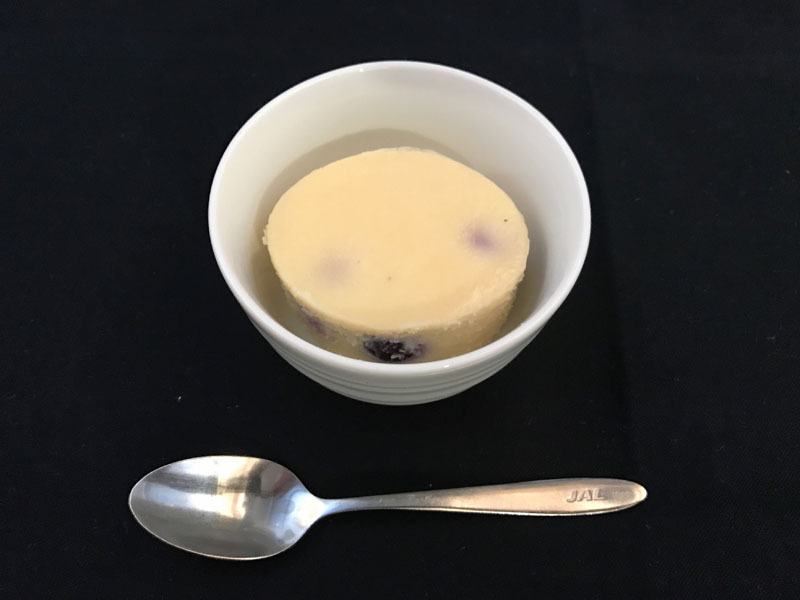 Finally, the blueberry cheesecake was a great way to end – light and fluffy, not too sweet and modestly portioned. Later in the flight, I tried a couple of dishes from the dine-on-demand menu. 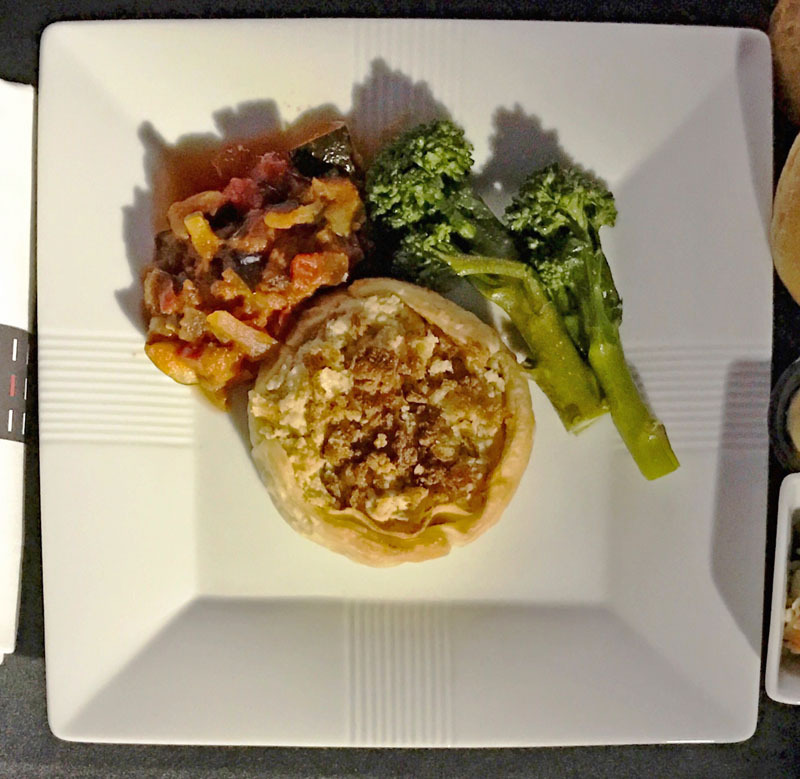 The first dish I tried was the tasty vegetable croustade with beans and broccoli, which came with a small crab and pasta salad (not pictured). I also tried the pork belly with spinach and lotus root, which provided some simpler but still enjoyable flavours. Overall, I rate this as one of the best business class dining experiences I’ve had. 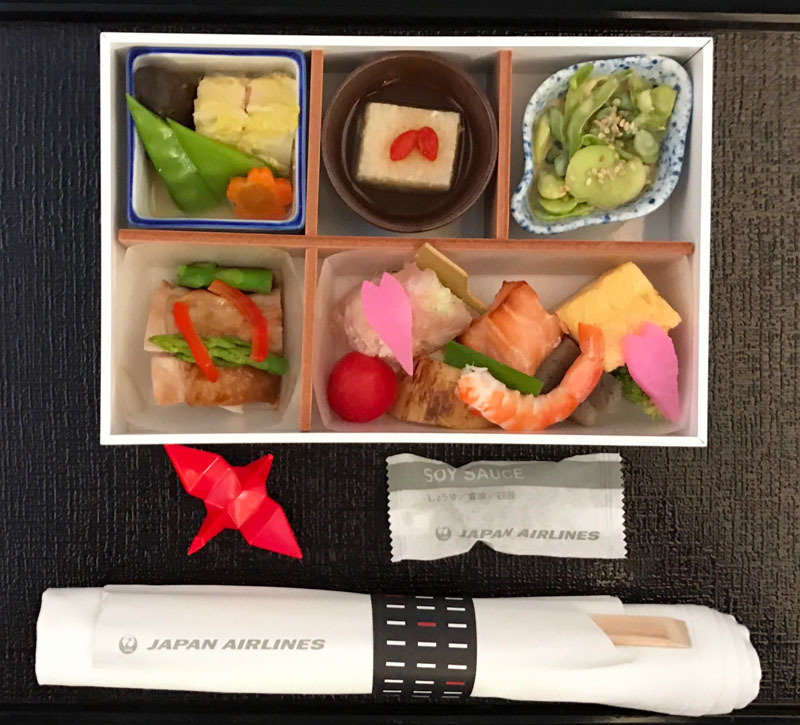 It’s rare for business class food to be memorable, but on JAL, the variety of the menu, the way it was structured and the quality of the food were all top notch. The entertainment on offer included new and recent films, both Western and Japanese, as well as TV shows, games, music and ebooks. The film selection was quite good, with about 20 options available, but the TV shows were limited in variety and, strangely, there was only one episode of some series. This is definitely an area for improvement. The LCD screen was large and of very good quality. Everything was controlled by a touchpad, which was a bit clunky. (In theory, it could also be used to order food and drinks, though that didn’t work when I gave it a go). Wi-fi was also available on the flight for a fee (three hours for $14.40 or 24 hours for $18.80 being the best value), but I didn’t want to try it as I had no desire to connect with the real world at the start of my holiday! This was my first time flying with JAL and I really enjoyed it. I’ll remember this as one of the best business class experiences I’ve had, thanks largely to the crew’s excellent service and the varied and high quality dining. The seat and cabin were very comfortable, though as I’ve explained above, the seat dimensions might be an issue for larger people. I would definitely recommend flying with JAL to Japan. It’s one of the most stylish ways to arrive in Tokyo, and you’ll feel like you’re experiencing Japan from the moment you step foot on board. JAL only flies from Sydney and Melbourne, so this option is mostly suited to Australians on the east coast. 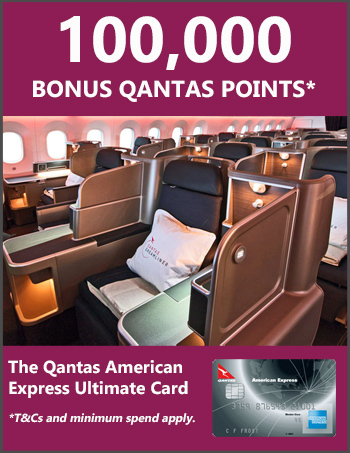 Qantas Frequent Flyers can redeem points for JAL flights, as I did, or earn points and status credits on paid fares. 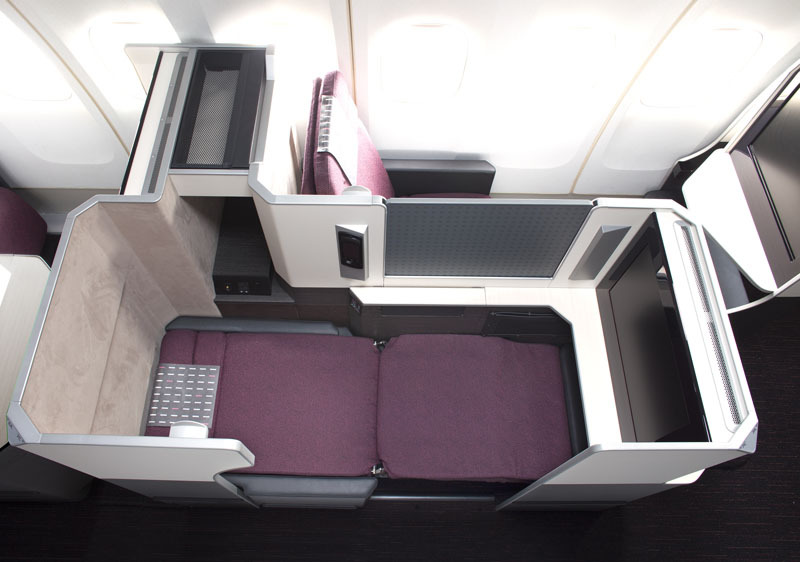 You can now book Japan Airlines via the Qantas website so must easier to redeem a flight with JAL. How did you managed to book a 787 from Sydney to Tokyo on Business using QFF? I’m really keen to fly with my partner on JAL business using QFF points as the service is a lot better. You can book JAL now directly on the Qantas website. 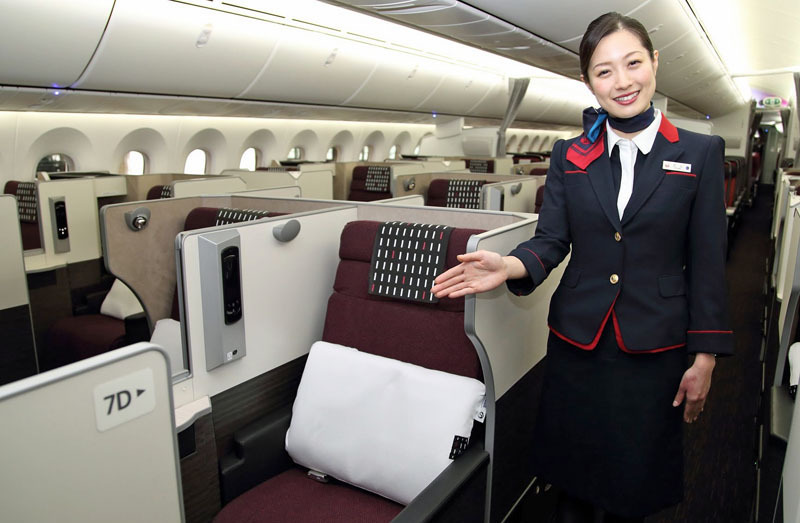 Simply log in and search for reward seats – if there are any JAL ones available they’ll show up in the search results. JAL only flies from Sydney, so this option is mostly suited to Australians on the east coast.?? Yep just Sydney and Melbourne for now. Great review. I have booked this flight for Jan 2019 using QFF points. Qantas just added JAL reward seats to there online booking systems. Thanks for that great review Kris. My husband and I flew BA business to London in 2014 (cheaper than QANTAS) and really enjoyed it. Now that we’ve decided to revisit I’ve started my research again and have been checking out recent reviews for BA and unfortunately a lot of them are very disappointing. When I found that JAL is a QANTAS One World partner I started with the reviews and now I’m sold. Japan has always been on my bucket list so I ‘ll have to look into staying before the London leg. I’ve tried many times to find a FF spot on JAL. However never been lucky enough. That’s because the Qantas website doesn’t display JAL reward seats. You need to view it through the British Airways website when planning your trip and book on the phone with Qantas.